There’s nothing quite like Rowwen Hèze in The Netherlands. This Dutch band (from the southern Limburg) has its 30th anniversary this year, and celebrates it in style with friends. Limburgs Museum opened an exhibition on them and decided to also put a spotlight on the dedicated fan following of these local celebrities! Who are these loyal supporters? And is a local exhibit on fan cultures really that important? I would argue, yes. Rowwen Hèze is something unique. While the song lyrics are in a local dialect, they draw many fans from The Netherlands, Germany and beyond. It’s a nice combination of American rock and. For most people, this is a party band, associated with the local carnaval and rural concerts and festivals. But Rowwen Hèze also does theater tours often, which are more suitable for their intimate songs and unique repertoires. Limburgs Museum celebrated 30 years of Rowwen Hèze in style. An essay collection was released with contributions from scholars, fans and locals. It features, for instance, an outstanding essay by Lotte Thissen on music, and local identity and dialects. The exhibition itself was inspiring. True to the spirit of the band, there were party tents in which themes of exhibit were addressed, such as the band’s early days and its sources of inspiration. In the middle of the room, a large screen was set up with a pub decor, where the music videos were broadcasted. 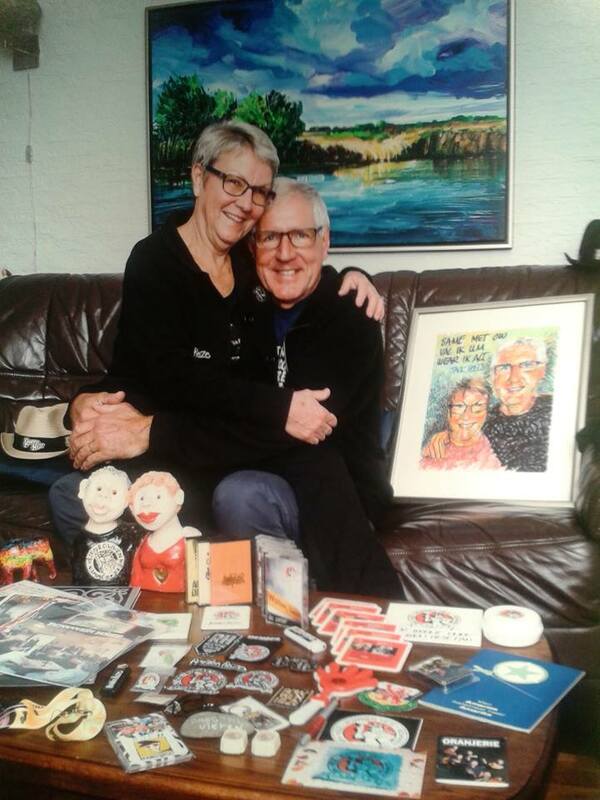 Soon the videos will give way to a documentary on Rowwen Hèze fandom, shot by director Louk Voncken. 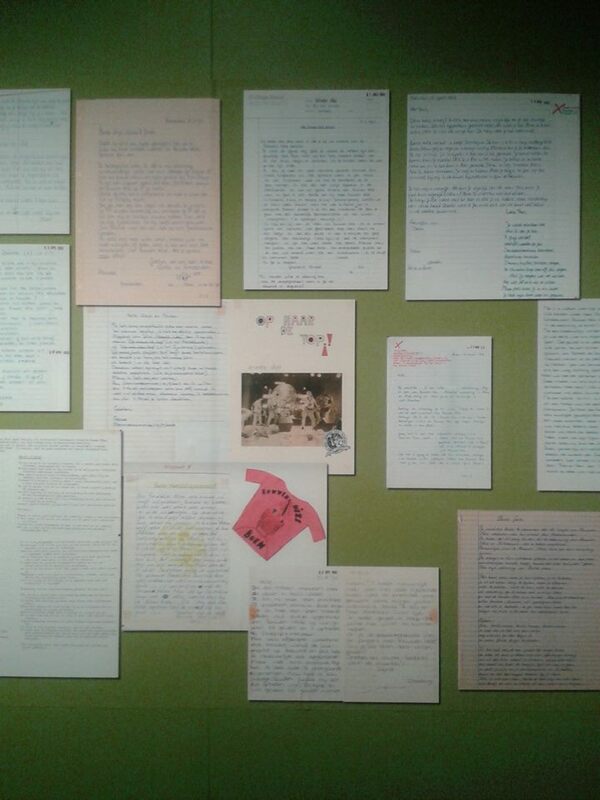 Much of the exhibit revolved around fandom, and paid attention to the early days of the fan club, for instance. What I highly enjoyed were the portraits of fans and their collections. These were really outstanding photographs that capture fandom as we all live it. Fans from all ages were displayed, surrounded by memorabilia and autographs. I think many of us will recognize this. (I for one still have tons of After Forever and Epica autographs, posters and shirts.) Some of the photographs were quite intimate. One portrayal, in black and white, showed a fan with his Rowwen Hèze tattoo, sitting outside and enjoying himself. He was not swamped with merch or albums, but just showcasing his body, thereby acknowledging how very affective and personal his relationship with the band is. Of course, the portrait that you see here celebrates fandom in a much more visible way. The collection of the fan is not just of fannish objects, but also of local objects that are related to his fandom. He holds an actual street sign of the Jack Poelsstraat in America, for instance – a street christened after the singer of the band. How did he get his hands on that? 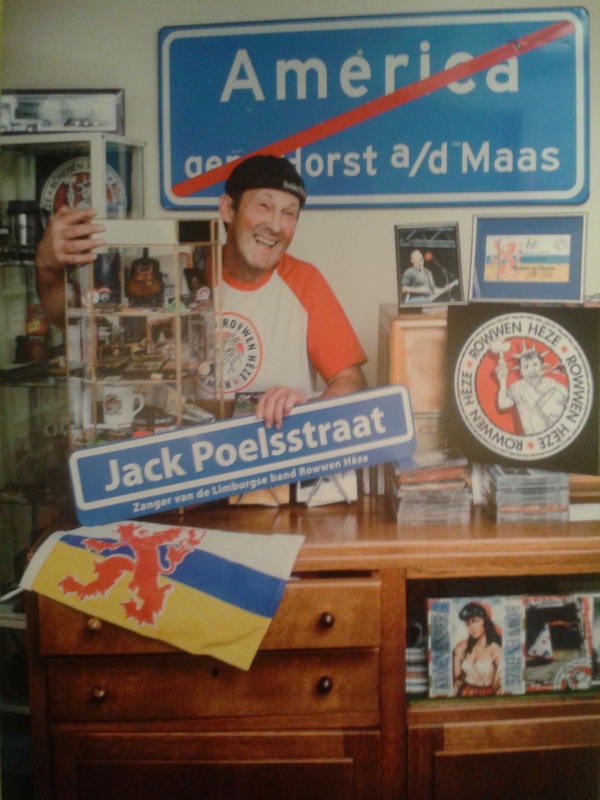 This lovely exhibit is a must see for fans of the band, but also for those that are interested in the spirit of Limburg, the most southern area from The Netherlands. The fact that the exhibition showcases fans is telling. I hope that more museums will follow suit. In The Netherlands, most exhibitions still focus on celebrities, artists and cultural producers, but hardly ever pay attention to the audiences that follow them throughout the years. The story of a band does not have to be told through facts or life histories of band members. When we look at the people whose life was transformed by a band, we get a fully different story.